I think it takes a certain type of person not to attend a memorial for your own brother IMO, especially when you have no other commitments and plenty of money and resources to do so. Yes they are retired, but this is not just a formal state event but a personal event for a family who have lost one of their own. Every other "retired" Sovereign/Royal take the time to attend family events even when they drop the official ones - Juan Carlos & Sofia of Spain, The Duke of Edinburgh, Grand Duke Jean, Princess Beatrix. The fact is Albert & Paola gave up on the throne and gave up on their family. So if this is true it was only consequent and fair of them not to come, wasn´t it? They have only cared about each other (and at times only about himself or herself). Family is an afterthought to them. They can now stop pretending that they actually care much. The treatment of the former King (the government making promises which were not honoured and the new King seemingly not willing to spend energy into it) plus King Albert's fear what will happen to a widowed Queen Paola. Will she become a Liliane 2.0 having to sell items or depending on the generosity of supporters to help her out? After 40 years of public service as Prince de Liège & Heir and 20 years of public service as King of a turbulent monarchy as Belgium, Albert probably was and is very non-amused that a given word, and agreements around his abdication, were not honoured. Relationships can become bitter for less. He should only have announced his decision to abdicate after the issues about hs future dotation would have fixed and not trustes spoken promises. He also seems to have had no Problems when his sister-in-law Fabiola's dotation was shortened a few year before her death. What promises were broken? As I understand an amount was stated for Albert's income, Albert was under impression it wouldn't be taxed and yet it was, just like every other royal receiving an income from the state is now taxed on it. He does sound very self important..
On the memorial service yesterday attends also the Helene Vestur ex-wife of Prince Jean of Luxemburg. 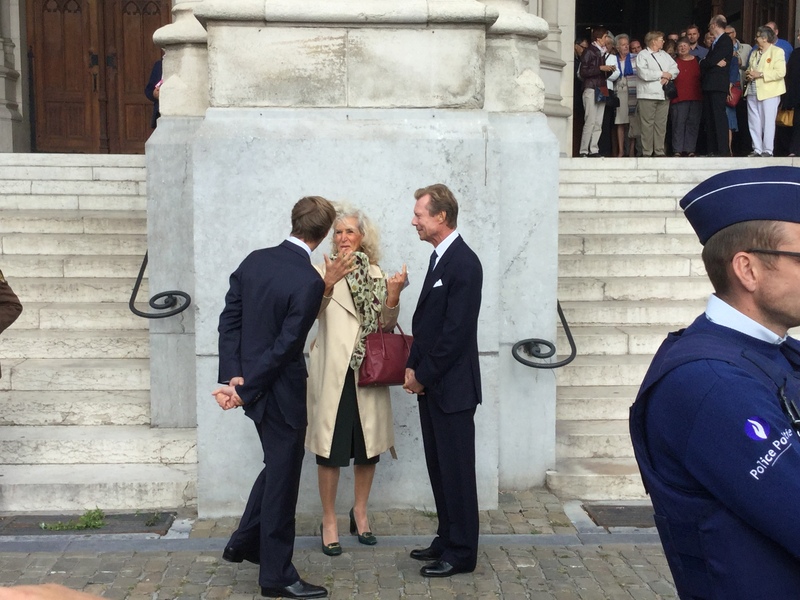 In the picture she is talking with the Grand Duke Henri and Prince Louis. Okay. I make an agreement with you. I promise you 1,4 million free of taxes. An all-inclusive use of a royal residence. Staffing. Transportation. Maintenance. On second thought I say to you: my dear Denville, after 60 years of service (! ), we come back on our promise. No 1,4 million but 923.000 Euro. Not tax-free but taxed. The residence can be used but you have to pay the energy bills, the maintenance, the staffing, the transportation. 923.000 after taxes will be around 550.000 netto per year. Good luck with paying the bills. The King was in such narrow shoes, financially, that he sought help from the Donation Royale. For an example, could the Donation pay for the utility and energy bills, the maintenance of the Château and the parc du Belvédère? Apparently the Donation Royale was willing to help the old King but was in narrow financial shoes itself. Due to the worldwide financial crisis the revenues on investments were zero while the Donation had to upkeep a formidable royal patrimonium. Possibly the King stays in Italy or France, or on the boat, because living at Belvédère is too costly for him and eating away all his savings. It is cheaper to stay in a holiday villa with three staffers than in a monumental castle. What kind of person, exactly? I've never attended the memorial masses my parents and other family members have organized for my grandparents simply because I don't believe in such things. Does that make me a bad grandson? Does that mean I never cared or that I had a bad realtionship with them? It seems like for some the only way to remember somebody is going to church. Quite a small town talk view. Maybe Albert should have attended as a former monarch but, as I see it, it's his late brother and so it's only his own decision how to celebrate his memory. Mind, it might not be in a church and it might not be only on a given day. Albert and Paola did attend in February, so all these money issues don't seem a reason not to attend a mass to remember your brother. Albert attended the general remembrance mass in February, so while you don't believe i these kind of masses, Albert apparently did value them in the past but is boycotting this specific one to apparently make some kind of statement. It is alleged that Queen Mathilde is very close to her own family by birth and is not friendly with the in-laws. So, I don't think that such would be the cause for a schism, but, it shows that all is not that friendly within the BRF. I have never seen a picture or video of Queen Mathilde or her children with the Udekem d'Acoz. Do they meet only in private ? A casual observer would think they don't have much of a relationship these days. The fact that he has attended this kind of masses in the past should prove that he cares for his brother's memory and that it wasn't some alleged lack of affection that prevented him from attending, right? Boycotting because of disagreements with the government or his son is childish, but going beyond that is classless. Albert attended when he had to as king and he attended the general mass of all deceased members of the family after his abdication (in 2015, so that was most likely mainly about Fabiola's memory). This was the first mass specifically organized for his brother after his abdication and he decided not to attend. So, while I sincerely hope that him not attending doesn't mean that he doesn't respect his brother, apparently his regards for his brother did not trump his childish desire to do as he pleases without any regard for the message it conveys. All in all, we don't know exactly what but something was more important to Albert and Paola than publicly honoring their brother(-in-law)'s memory 25 years after his untimely death. Albert attended when he had to as king and he attended the general mass of all deceased members of the family after his abdication (in 2015, so that was mostly mainly about Fabiola's memory). This was the first mass specifically organized for his brother after his abdication and he decided not to attend. So, while I sincerely hope that him not attending doesn't mean that he doesn't respect his brother, apparently his regards for his brother did not trump his childish desire to do as he pleases without any regard for the message it conveys. In the last alinea you are out of line with the qualification childish in your first alinea. So if he attended in february what exactly is still your problem...?! This is a special one remembering Baudoin 25 year later.. and he seems to be prioritising his holiday over it.. possibly because he Is in a sulk about his retirement pension. When he possibly stated something like: "these messieurs can kiss my b*lls, they will not see me anymore. Out of the question!" Then he is actually living up to his words. More so than the messieurs of the Government who promised A but did B.
so he is taking revenge against his late brother and his memory, because he is in a sulk against politicans. I cannot come up with a good reason for him not to attend, so I still think him prioritizing something over attending his brother's mass is childish but he is free to give an explanation and I might change my mind. I have to correct myself. He did not attend this year in February. Only in 2015. And as Denville explains. There is a difference between attending the yearly general mass (which they don't attend each year) and a specific mass organized for his own brother for which lots of nieces and nephews and even greatnieces and nephews turn up but his only brother for some unknown reason decides not to come.